December 1863. Bridge at Strawberry Plains, 20 miles northeast of Knoxville. Wet-plate glass negative by George N. Barnard, half of stereo pair. "These photographs are of the Siege of Knoxville, Nov.-Dec. 1863. The difficult strategic situation of the Federal armies after Chickamauga enabled Bragg to detach a force under Longstreet which aimed to drive Burnside out of East Tennessee and did shut him up in Knoxville, which he defended successfully. These views, taken after Longstreet's withdrawal on December 3, include one of Strawberry Plains, which was on his line of retreat. 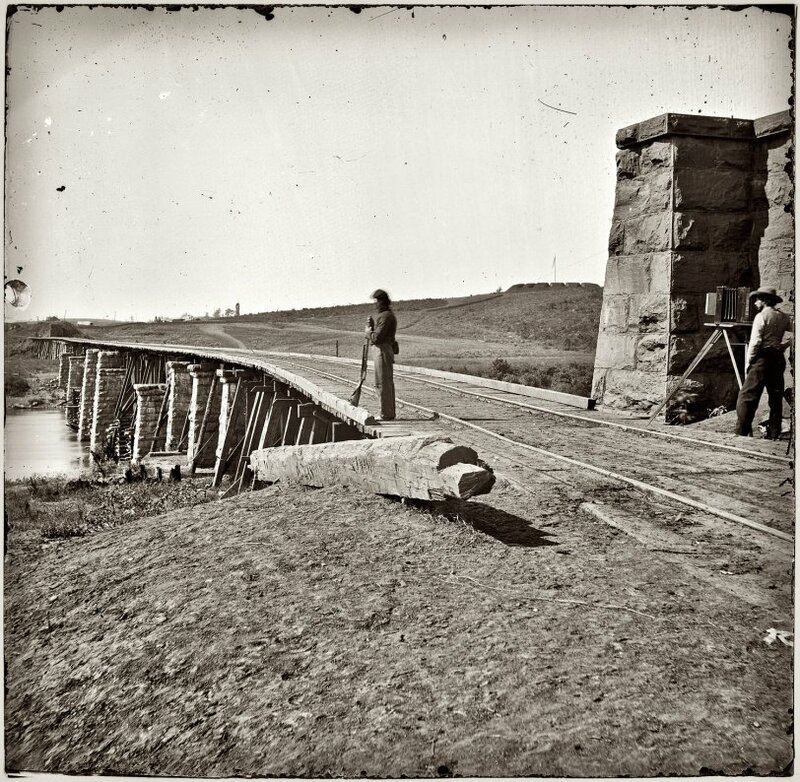 Barnard was photographer of the chief engineer's office, Military Division of the Mississippi, and his views were transmitted with the report of the chief engineer of Burnside's army, April 11, 1864. View full size. Submitted by Barbara on Tue, 04/06/2010 - 12:13pm. The bridge has long since been replaced, I am sure, but is there a road today that crosses the creek at this point? If so, what is its name? My great-great-grandfather passed this way with the Union Army in Jan 1863. Submitted by nda5150 on Wed, 06/04/2008 - 7:57pm. Pvt. 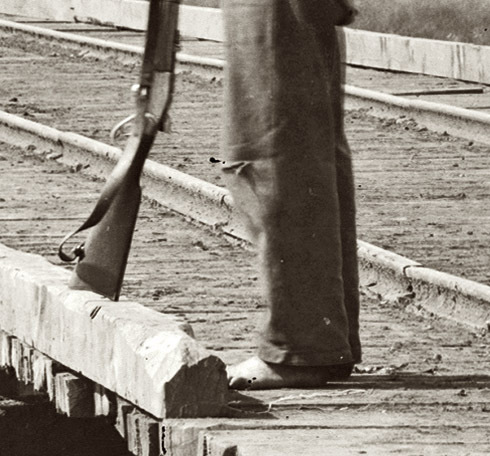 Joseph A. Rogers (CSA), an ancestor of mine, served in the 43rd Alabama Infantry Regiment, and was KIA defending the bridge in the above photograph. Submitted by Riley Wells on Sun, 02/17/2008 - 10:14am. However, it seems to me a matter of perspective. My Great-Grandfather fought for the Confederacy. My Uncles and Aunts remember this man. I'm not that old and in my family the War between the States is an unforgotten (and unforgiven) event. A long time ago as the clock ticks, but not so long ago in degrees of separation. Submitted by Anonymous Tipster on Sun, 02/17/2008 - 5:01am. wonderful. 1863, such a long time ago, like 6 generations, yet the face of the photographer leaves me speechless, wonder what he's thinking? Submitted by townes on Fri, 11/30/2007 - 2:27pm. I have seen this bridge before! "The Good the Bad and the Ugly." Submitted by Tyler on Fri, 11/30/2007 - 11:53am. I can't tell for certain, but it appears that the soldier is wearing no shoes (in December no less!). Which, to my understanding, was the case for many Civil War soldiers, but I still can't help but be humbled by what people went through then. Submitted by carljohnson on Fri, 11/30/2007 - 10:35am. What a great legacy these old negatives have left us. I only wish my poorly processed Tri-X from 30 years ago looked this sharp!